The farm: As humans bunker down in cities worldwide, the rural pastiche becomes a fantasyland, a setting for movies, sci-fi TV shows … and slots games like Barnyard Bonanza! So break out all the farm-related clichés and puns you’d imagine us spilling before you on this page – or just get to playing the darn thing already…Yes, Barnyard Bonanza *is* another funny animal-themed slot game, this particular one of five reels and 20 paylines. The wild symbol is the farmer a-tractor, the boss of his tiny agricultural kingdom. 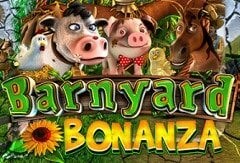 Barnyard Bonanza is another funny animal-themed slot, isn’t it? An aside here for a moment. Folks, is it me or do you just have to wonder about these franchises involving farms. In the Barnyard Bonanza slot, we get the typical smiling horses, grinning pigs, beaming cows, cheery chickens, etc. – sheesh, a few of these barnyard beasties don’t even have lips and they’re smiling? Either these animals are gloriously, epically drugged or they’re somehow naturally asserting that “Yes, we're happy to be exploited for our eggs, pumped free of our milk constantly and eventually eaten, hurray!” Grim, perhaps, but true. And the low-paying symbols are…? Of course they are! Barnyard Bonanza follows the lead of pillions of other slots in including the A, K, Q, J, 10 and 9 icons on the low end of the paytable. Bizarrely enough, these are done up *as freakin’ fruits*! Seriously? I mean, why not, likesay, just *have the damn FRUIT SYMBOLS* instead of throwing those poker-run symbols out there one more time? Please? How much can I bet in the Barnyard Bonanza slot game? The Barnyard Bonanza slot’s 20 paylines are locked, but as little as 10¢ (that’s just ½¢ per payline!) per spin may be wagered. Max bet is $100 per spin. What is the biggest jackpot wins in Barnyard Bonanza? Well. Landing five scatters (the impossibly grinning chicken) is worth a crazy 1,000x the wager, making Barnyard Boogie a great choice for jackpot-chasing penny slots players. Come on, that payout wins $100 on a ½¢ bet? Nice. How are the sound effects and music in the Barnyard Bonanza slot? You’d think there’d be lots of stereotypical country music-type twangin’ in the background, but thankfully, the obnoxiousness is kept to a minimum in this area. Instead, we get somewhat subdued (okay, so not totally out-of-hand) riffs on wins, as well as some animal-y cacophony. Can I play Barnyard Bonanza for free or real money? Either, actually – and you can do both from right here. Whether you’d like to give the Barnyard Bonanza a spin or two (or several hundred), simply click on the game’s name or on the window above. You’ll be given the choice of playing modes. Free play we can host and so you’ll play right here – with no downloads necessary. For real money, we’ll help you over to a partnering casino which is internationally licensed and accepting players from your country. 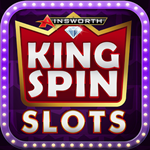 Enjoy slots safely and securely with us!